Columbus Grove’s Jacob Olgesbee plays his shot from the second tee during Monday’s PCL Golf Championship at Pike Run Golf Club. The Bulldog linkster carded an 84. Kalida’s Christian Nartker watches his second shot during Monday’s PCL Golf Championship at Pike Run Golf Club. Nartker shot a 74 to win the PCL medalist honors. 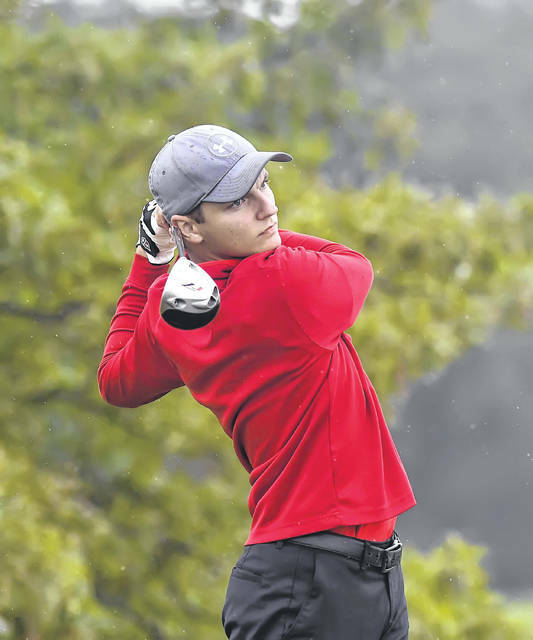 MILLER CITY – Led by medalist Christian Nartker’s 74, the Kalida boys golf team garnered the Putnam County League championship at Pike Run Golf Club Monday. The Wildcats compiled a 317 score, outdistancing second-place Miller City by 17 strokes. Third place Columbus Grove was next at 360, along with Ottoville’s 366, Leipsic’s 385 and Fort Jennings’ 430. The golfers had to endure a little bit of early-fall weather with Monday’s cooler and wetter conditions at Pike Run. “That was a bit different than we’ve been used to this fall. We just had to be mentally tougher today,” Nartker said. “We’ve tried to practice as much as we could this season every chance we could to make sure we were ready for it, just in case. There were times the ball just stopped on the greens today; other times it came out like a rocket. You have to adjust when you can in order to golf well on a day like this. Nartker’s effort just continued a consistent effort by the Wildcat golfer. Kalida head coach Ken Schnipke was pleased with the performance of his team. “A 317 was a good score today. It would have been a good score on a nice weather day, let alone with the chillier and wetter conditions we had today,” Schnipke said. “Christian has been a steady leader for us this year. Outside of a couple of rounds this fall, he has been very consistent. He does a great job of helping out with the younger players and getting them prepared. 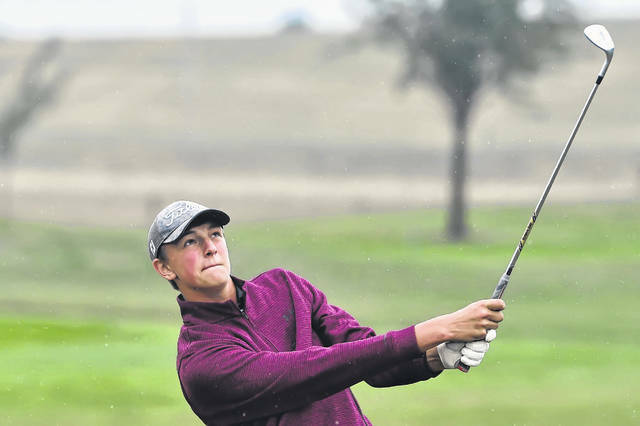 Fellow Wildcat Josh Recker shot a 76 to take second-medalist honors behind Miller City’s Luke Lamer. Low man for Columbus Grove was Jacob Oglesbee with an 84, while for the Big Green, low golfer was Carter Schnipke’s 86. Top golfer for the Vikings was the 90 of Brock Lammers, while the Musketeers’ low man was the 104 of Logan Schimmoeller. COLUMBUS — After moving up two spots last week, Lima Central Catholic moved into the No. 5 spot in the Division VI Associated Press High School Football poll released Monday. The Thunderbirds defeated Toledo Rogers, 36-6, last week and they will will travel to Indiana to take on Woodlin this week. Coldwater and Marion Local maintain the top two spots with Coldwater ranked No.1 and the Flyers ranked No. 2. St. Marys, after beating Kenton, 70-29, last week remain atop of the Division IV last week. The Riders will travel to face Elida this week. Leipsic, who will face top ranked McComb in Division VII, moved up a spot to No. 5 behind Minster. Putnam County rival Pandora-Gilboa cracked the top 10 after coming in at No. 10. Crestview, which had been No. 4, dropped to 13th, after losing to Columbus Grove last week. The Shawnee boys team was ranked No. 9 in Division II and the Shawnee girls came in at No. 4 in the Ohio Scholastic Soccer Coaches poll released Monday. The Indian boys are 9-1-1 overall and 5-0 in the Western Buckeye League. The girls are undefeated at 10-0-0 and 4-0-0 in league competition. OTTAWA — Ottawa-Glandorf won in straight sets, 25-16, 25-19 and 25-21. O-G’s Taylor Alt had 15 kills and four aces and Erica Annesser had 15 kills and four aces. Claire Eiden had 13 digs and four aces. Kendra Ellerbrock had 20 assists and Bri Schimmoeller added 18 assists. PANDORA — Leipsic won in straight sets, 25-13, 25-8 and 25-15. For Leipsic, Selena Loredo had 22 assists and was 44-45 setting and 18-19 serving. Hayley Heitmeyer had 13 kills three blocks and was 12-12 serving. Carlee Siefker recorded 11 kills and 10 digs and Brooke Brown had three aces and nine digs. Kacey Dulle had 13 digs and two aces and Lyndie Hazelton had nine assists. MARION — Bath won in four games, 25-15, 25-18, 21-25 and 25-17. For Bath, Caitlyn Renner had 29 assists and Mallory Clark had 12 kills and five blocks. Kali Armstrong had four aces and Eden Adkins had 11 digs. LIMA — Lima Central Catholic won in straight sets, 26-24, 25-16 and 25-20. Hannah Riepenhoff had 26 assists and Kennedy Park had 15 kills. Victoria Lauck had 21 digs and three aces and Rose Williams had six blocks. DELPHOS — Delphos Jefferson won in straight sets, 25-12, 28-26 and 25-21. For Temple Christian, Sophie White had two aces and 13 digs and Bethany Whitman had two aces and seven kills. Anna Acklin had three aces, three kills, 19 assists and six digs. Haley Walters had two aces, two kills and two blocks and Lizzie Helser had nine kills, one block and eight digs. COLUMBUS GROVE — Columbus Grove won in four sets, 25-22. 25-18, 25-23 and 25-21. For Shawnee, Kelsey Fischbach had 32 assists, 13 digs, 3 blocks and two kills and Amber Greeley had 10 kills, five blocks and two aces. Kelly Armentrout had nine kills two blocks and four digs and Peyton Duebler had seven kills, five blocks, eight digs and three assists. Dayle Aldrich recorded 23 digs. DEFIANCE — Van Wert got singles wins from Allie Etter and Emma Rutkowski and doubles win sform the pair of Liv Kline and Paige Moonshower and the duo of Jada Buckner and Lizze Rutkowski. OTTOVILLE — Ottoville’s Jayden Schnipke and Dalton Davis both scored goals in the final five minutes. For Temple Christian Jacob Holloway scored on a penalty kick. Big Green goalie Kaiden Trentman had eight saves and Pioneer keeper Cody Motter produced seven saves. For Ottoville Brynlee Hanneman had nine kills and 12 digs and Quinley Schlagbaum had four kills, nine digs and four aces and Kylee Hoersten had 21 assists and 12 digs. WAUSEON — Continental’s Konnor Okuley scored the lone goal for the Pirates. FINDLAY — Goals scored for Liberty Benton were Maddie Parmelee and Maya Rickle with 2. Others scoring goals were Savannah Richards. Kalida keeper Bailey White had nine saves and Falcon goalie Sophie Aschemeier had six saves. Liberty-Benton remains unbeaten at 9-0-1 and Kalida falls to 7-4-0. KENTON — Shawnee got goals from Sophia Fusillo, Tessa Jordan and Zoe Ludwig. Madi Mason and Rachel Russ were credited with assists. Indian keeper Grace O’ Connor got the shutout and recorded four saves. Kenton goalie Kaitlin Heberling made two saves. Shawnee improves to 11-0 and 5-o in the Western Buckeye League and Kenton slips to 8-3-1 and 3-2-1 in league action. OTTAWA — Leipsic’s Hannah Goedde and Wapakoneta’s Taylor West shared medalist honors after both shooting 44s. Other Leipsic scores were Morgan Kamphaus 51, Jala Hazelton 54, Maddie Walther 59 and Ella Rigel 70. Other Wapakoneta scores were Olivia Place 48, Allison Kohlrieser 52, Alyssa Watt 72, Addie Place 51 and Emma Terrill 64. Cameron Collins 44 and Hunter Jolliff 47. For Fan Wert, Evan Knittle fired a 46. Other Cougar scores were Austin Edlebrock 46, Cameron Terhark 47 and Zane Fast 52. CONVOY — The 18th annual Fricker’s Lady Knight Volleyball Invitational is set for this Saturday at Crestview High School. The field features eight teams who will compete for the title of champion. Matches begin in both gyms at Crestview at 9 a.m. The admission price for the entire day is adults $5 and students $4. No passes are accepted for this invitational tournament. The teams that are attending include three state-ranked programs in D4 (Marion Local, Norwalk St. Paul and Arlington) and one state-ranked team in D2 (Ottawa-Glandorf in the latest Ohio coaches’ poll. The first matches of the day feature #2 Ottawa-Glandorf (11-1) against South Adams, Indiana (14-9) at 9 a.m. in the high school gym and #4 Marion Local (10-3) vs. Celina (5-7) in the middle school gym. The second matches will showcase Crestview (8-3) vs. #9 Arlington (12-1) in the high school gym. #8 Norwalk St. Paul (10-1) will compete against Edison (Milan) (5-8) and complete first round action in the middle school gym. ADA - Junior linebacker Mark Niles (Miramar, Fla.) and senior kicker Chase Watson (Lima/Elida) have been named OAC Football Athlete of the Week honorees, the league office announced Monday afternoon with the release of its weekly awards listing. Niles was named the OAC Defensive Player of the Week after an impressive outing at Otterbein last Saturday afternoon. In the Polar Bears tight-knit 13-7 victory, the junior linebacker led the team with 14 total tackles, including eight solo tackles and a 0.5 tackle for loss. In addition, Niles registered one PBU and forced a fumble that led to an Ohio Northern field goal. Meanwhile, Watson garnered the OAC Special Teams Player of the Week award after a solid seven-point afternoon. The senior would make his lone PAT attempt and finish the day two-for-three in field goal opportunities, connecting on 30-yard and 36-yard attempts. https://www.limaohio.com/wp-content/uploads/sites/54/2018/09/web1_PCL-Golf-RP-002-2.jpgColumbus Grove’s Jacob Olgesbee plays his shot from the second tee during Monday’s PCL Golf Championship at Pike Run Golf Club. The Bulldog linkster carded an 84.
https://www.limaohio.com/wp-content/uploads/sites/54/2018/09/web1_PCL-Golf-RP-005-2.jpgKalida’s Christian Nartker watches his second shot during Monday’s PCL Golf Championship at Pike Run Golf Club. Nartker shot a 74 to win the PCL medalist honors.